Each year a select group of multisport enthusiasts take on the elements and immerse themselves in the natural beauty of Knysna and surrounds by taking on the Ultimate Multisport Challenge during the Pick n Pay Knysna Oyster Festival – the Maserati BIG5 Challenge. With 100% of the well-known Featherbed Trail Run routes affected by the fires, safety and environmental concerns forced the event hosts and organisers to find an alternative course and format. With the event being in its tenth year organisers always planned to do something special and the new concept that participants ran today honoured the town’s amazing fighting spirit. 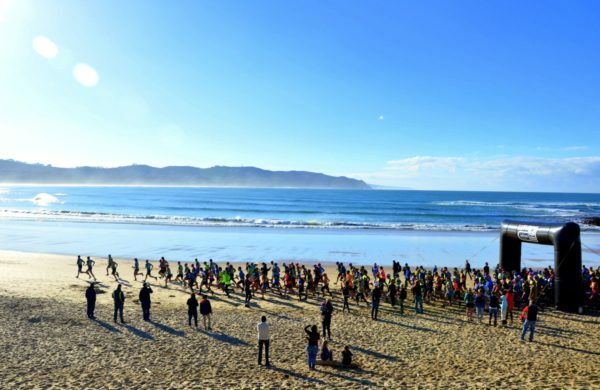 The route changed, the timing changed and the logistics changed; but that unique Knysna-feeling the trail run is famous for was stronger than ever as almost 700 runners lined up on the beach for the 21km, 15km and 11km races. The new route started on the beach in Buffles Bay and took runners along the rocky shoreline and the beach towards Brenton-on-Sea where the long and short routes split. Runners had a short jaunt in the fire-damaged area before popping out on the old railway line to finish back at the Cruise Café in Knysna. In the Women’s Category Vicky van der Merwe took line honours and now lies third overall. “It was an amazing run, I am just very sad to see all of the fire damage. It is still beautiful and the views are amazing, I think the organisers did a really good job of creating a new route. I really have to maximize my running so I am looking forward to Saturday and make up time for the MTB X on Thursday.” Fienie Barnard still holds the overall Maserati BIG5 Challenge lead in the category and will be looking for a strong MTB X event on Thursday to keep the field at bay. Local hero Melikaya Nsizi took the win in the exceptionally challenging 21km distance with Shaun Gregory and Marsel Roos in second and third respectively. Columbia Sportswear is a proud sponsor of the Big5 Challenge and is running the Unite 4 Knysna Campaign in conjunction with the prestige event. In the brands commitment of being tough and tested against all odds, they stand shoulder to shoulder with the community of Knysna and the surrounding areas, and pledge 10% of all purchases at the Columbia SA BIG 5 Challenge Store at the event and online at www.columbiasportswear.co.za to the Knysna Rotary Fire Relief Fund. For more detail on the Maserati BIG5 Challenge, and to enter visit www.big5sportchallenge.com or follow them on twitter @big5challenge or Facebook/Big5SportChallenge.